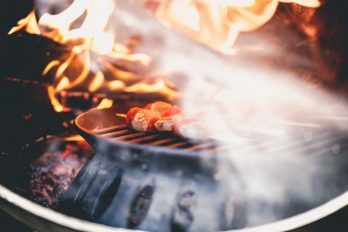 Woodfired Party Food is a real winner – great at any time of year but especially so at Christmas with the flames burning in the background for a festive glow. Chop the fish very finely or mince it in a food processor and turn the mixture into a large bowl. Add all the rest of the ingredients except the oil and mix well together. I find it’s easier to do this by hand. Divide the mixture into little pieces the size of a walnut. 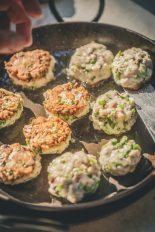 Shape them into fish cakes by pressing them between your thumb and index finger to make discs 1cm/½“ thick and 2.5cm/1” wide. Bring the embers on to the oven floor and place a wide frying pan on top of them. Heat it up and when the pan is hot, add the oil. Put the fish cakes in the pan and cook until the fish has become firm and cooked through, golden brown on each side but still juicy in the middle – about 3-4 minutes. Serve at once with chilli dipping sauce and lime juice squeezed over the top. Soak the wooden skewers in a dish of cold water for a couple of hours. Mix the harissa paste with the sunflower oil and the lemon zest. Season with salt and pepper. Add the tiger prawns and mix well. Leave in the fridge to marinate for 30 minutes. Cut the red pepper in half from the top down and take out the seeds. Cut each half of the pepper into 6 long strips and cut each strip into 3 so you end up with 36 bits of pepper. Take the skewers out of the water and shake dry. Thread the prawns and pieces of pepper onto the skewers so you get 3 of each on each skewer, alternating them as you do so. Heat a grill pan in the oven for 10 minutes. Add the skewers and grill for 50-60 seconds each side until the prawns have turned pink and there is some charring on them. Take the skewers out of the oven and squeeze over the lemon juice. Not so much a recipe really – get 500g chipolata sausages and squeeze each gently into 2 twisting them in the middle before cutting them in 2. Cook the sausages in a hot frying pan with a little oil until cooked through. Squeeze 1tbsp runny honey into a bowl with 1tsp of your favourite mustard and add the cooked sausages. Stir gently together and sprinkle over 1tbsp sesame seeds. Serve hot.